Candid Unheard Voice of Indian Microfinance: Indian Micro-Finance: Time for RBI to Get the (Legal) Framework Right! Indian Micro-Finance: Time for RBI to Get the (Legal) Framework Right! Writing about the current crisis, Mr Vijay Mahajan[ii] notes, "More disturbing are the recent reports alleging that some poor women have committed suicide due to the burden of over-indebtedness caused by MFIs. If even one of these cases is true, it is a matter of shame for all of us in the sector. Though we should not give up on the principle of sustainability and thus cost-covering interest rates, the greed and ambition of promoters/CEOs should not be allowed to convert a boon into a bane for the poor. This brings to mind a Kabir's couplet: ‘A poor man's sigh of grief is enough to burn even gold.’ Let us put our house in order before it is too late." Commenting on the post AP ordinance situation, in an interesting paper[iii], Mr Aloysius (Al) Fernandez asks the question as to whether Micro Finance - driven by pressures resulting from venture capitalists and other private investors which is characterized by quick growth, high profits, high cost (interest and remunerations especially for senior staff), IPOs and quick exits - could be leading to a Macro Mess? Undoubtedly, the post AP ordinance situation is quiet alarming and according to industry sources, banks have already stopped the disbursal of around `175 crore to `200 crore to around 44 MFIs the earlier week because of the stalled recovery of micro loans from MFI customers in Andhra Pradesh. Further, it has been reported that the despite the Hon Court’s interim relief, MFIs are still finding it very difficult to lend and/or recover their dues – a situation that was anticipated way back in May 2005...even as the suicides continue to mount according to SERP. Irrespective of whatever has been the trigger for the present crisis, the fact of the matter is that in May 2005, Dr Thorat (Former Chairperson, NABARD) and the author, in a paper titled, “Regulation and areas of potential failure in micro-finance”, presented at the NABARD high level policy conference at New Delhi with a Senior Joint Secretary (Ministry of Finance) as the chairman of the session, had indeed suggested that the burgeoning growth of micro-finance could result in a number of not-so-desirable practices being adopted and also predicted the eventual fallout for MFIs. Five years hence, there appear to be many such questionable practices in the Indian micro-finance sector. In fact, in response to above concerns expressed in the media about high interest rates, coercive recovery processes and multiple lending practised by some microfinance institutions, the Reserve Bank of India has now set up a Sub-Committee of the Central Board of Directors of the Reserve Bank to study the issues and concerns in this sector, including ways and means of making interest rates charged by them reasonable. The committee is chaired by Shri Y H Malegam, a senior member on the Central Board of Directors of the Reserve Bank of India. Other members of the Sub-Committee include, Smt. Shashi Rajagopalan, Shri U R Rao, Shri Kumar Mangalam Birla and Dr. K C Chakrabarty, Deputy Governor. Shri V K Sharma, Executive Director, Reserve Bank of India is to act as the Member Secretary to the Sub-Committee, which is to submit its report in three months. The broad terms of reference (ToR) for the Sub-Committee of the Reserve Bank’s Central Board of Directors are now available and among other things, the ToR for the Sub-committee includes: a) review of the definition of ‘microfinance’ and ‘Micro Finance Institutions (MFIs); b) examining prevalent practices of NBFC MFIs in regard to interest rates, lending and recovery practices to identify trends that impinge on borrowers’ interests; c) delineation of the objectives and scope of regulation of NBFCs undertaking microfinance and the regulatory framework needed to achieve those objectives; d) review of money lending legislation of the States and their applicability NBFCs/MFIs; e) examining the role that associations and bodies of MFIs could play in enhancing transparency disclosure and best practices; f) recommending a grievance redressal machinery; and g) examining the conditions under which loans to MFIs can be classified as priority sector lending and making appropriate recommendations in this regard. As shown in box below, studies by EDA Rural Systems and others also support the above findings and reinforce the fact that multiple borrowings exist in micro-finance. There is an added dimension here – as mentioned by several industry experts and corroborated by a recent study in Andhra Pradesh by APMAS, a majority of the MFIs have effective interest rates in range of 25 - 40%, including charges levied on compulsory insurance etc. ð In a study conducted at Ramanagaram[ix] for three months, it was found that “19 of the 20 households involved in the study were indebted to more than 2 MFIs/SHGs; 10 households to more than 4 MFIs/SHGs; and 2 households to a total of 7 MFIs”. a) Is it natural and/or healthy for MFIs to grow at the pace that they have grown? How have these MFIs been able to grow so rapidly, especially since 2005? What changes were made to their model which enabled growth at such a scorching pace since 2005? What was the role played by the bankers/lenders/investors in this very rapid growth? 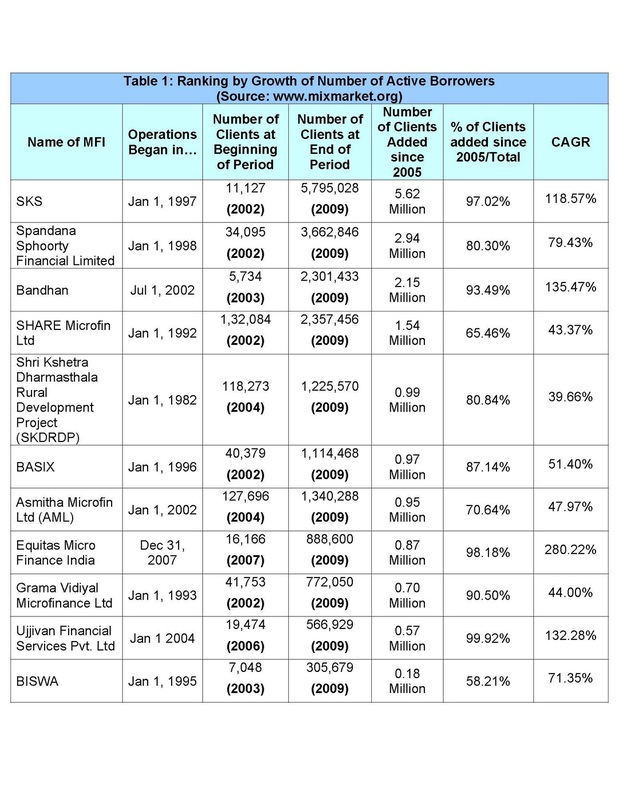 b) What can be said with regard to the capacities and systems of MFIs to manage this growth? What is the state of human resource management systems in MFIs and how much is this to blame for the present day crisis? How can staff working conditions be bettered? How can staff be made more sensitive and accountable to the above concerns and issues? c) Given that the financial statements of some of the top MFIs themselves admit the presence of frauds including non-existent borrowers, what can be said with regard to overall assets of MFIs (and their actual quality), acquired through such (burgeoning) growth? d) How widespread is the phenomenon of non-existent clients? How commonplace is multiple lending? What are the implications for priority sector lending? e) Given that most bank loans to MFIs are public deposits, should the banks have been more careful? What does this whole phenomenon say about the current due diligence process at banks? Are banks cutting corners as far as procedures are concerned? Is there good enough reason to believe that loans were “pushed’’ to MFIs as well as the poor women, resulting in the situation today? What is role and responsibility of Bank and MFI staff/management in this regard? f) Given that the MF clients have multiple loans and given that the effective interest rates are in the range of 25 – 40%, can these clients afford to pay such interest, especially for multiple loans, especially, in the wake of their livelihood situations? [vii] Srinivasan, N., “State of the Sector Report 2008”, Sage Publications, London, UK, 2009. [ix] Kamath, Rajalaxmi, Arnab Mukherji and Smita Ramanathan, “Ramanagaram Financial Diaries: Loan Repayments and Cash Patterns of the Urban Slums”, IIMB Working Paper No. 268. Please wait for an objective case study on Zaheera Bee, to be put up in the next 2 days. As per available reports, Zaherra Bee committed suicide on 13/09/2010 in Andhra Pradesh because she was hugely indebted and could not make the loan repayments to MFIs/Others. Can We Bring Back Ayesha’s Ammy?